Eleni Theofylaktou was born in a small town in the countryside, where music was never heard, as this would constitute an excess within nature. Therefore, as she was growing older she preferred working in silence or, rarely, listening to Callas’ arias and Greek folk music. She gave birth to her daughter at a very young age; the two of them almost grew up together, spontaneously engaging in various humorous or even sarcastic “actions”. Eleni studied Drama at the Roula Pateraki Drama School (1985) and graduated from the Faculty of Fine Arts in Aristotle University of Thessaloniki, where she studied Painting (1991) and Printing (1992). She holds an MA in Fine Arts from the University of East London (2001). During her studies she attended many art and pedagogy of art workshops and seminars. 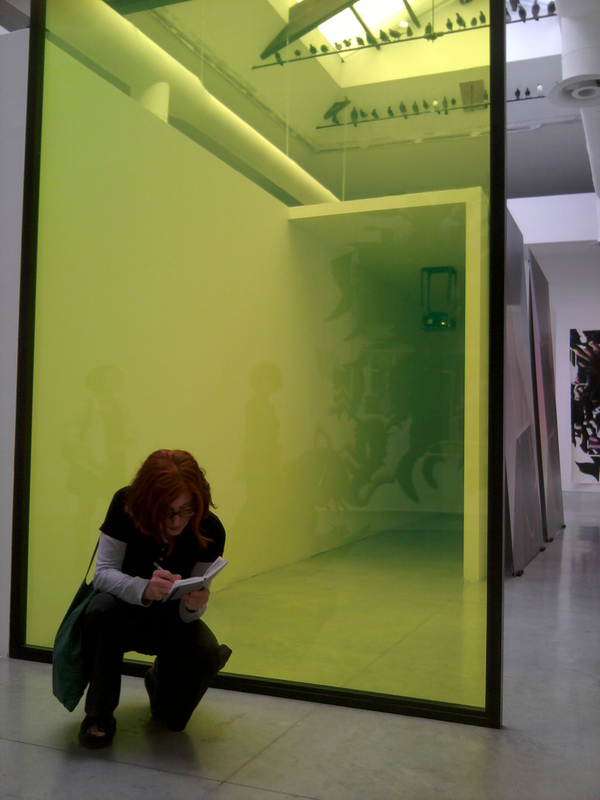 She frequently travels in Europe in order to stay in touch with the current tendencies in contemporary art. She has collaborated with numerous artists in residencies in Holland, Finland, Serbia and Turkey. She articulates her visual language with all kinds of material when these facilitate her concept; while she frequently expands her integrative concept in space through installations and performance. Since 1991 she has been an active artist in the field of visual art having presented many solo and group exhibitions as well as video installations, lectures and book illustrations. Since 1992 she has been teaching art in secondary schools and Aristotle University of Thessaloniki. For the past twenty years she has been studying and working in a bright and quiet studio in the centre of Thessaloniki.